Our new bundle is finally here!! Including 34 fonts and 12 Graphics Packs, its full of fantastic and tasty design products! Get this amazing set for just $29, but hurry it's only around for one single month, and then its gone. As always our Tasty June bundle comes with our Complete License. This allows you to use the products included within this pack for a wide range of commercial activities. Including on printed products, that are subsequently sold. This font duo was a best seller for a long time and we are so happy to offer it here for you. The curly swirly heavenfield font matches perfectly with its typewriter counterpart! Don’t be fooled by the neon, retro effect of this header.. This font is actually very modern! A twist of signature style with a slight script feel. The irregular baseline that runs through this font is flirty and so contagious! We find ourselves coming to use this particular typeface time and time again! 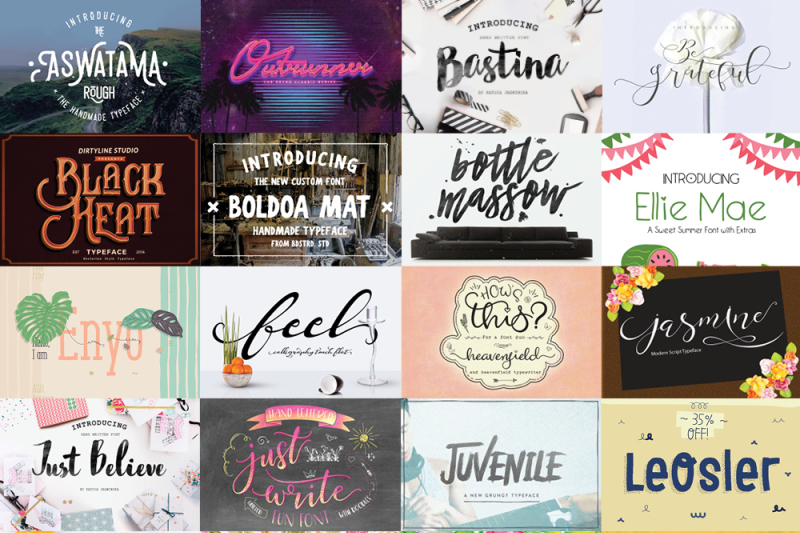 We cannot get enough of these thick, rough and ready brush fonts! Bastina has a little edge due to its irregular baseline and uneven letters. Just Write includes three fonts that are perfect for layering. Use the script font as your base and then add the shadow and then lastly the cute dots! Combine the three with some funky doodles that are included and you’re done! The bonus elements included in this font are so fun and fabulous we just can’t get enough. The watercolour elements and florals are so gorgeous and compliment Michelly wonderfully. The Witch is a layered font family that combines multiple fonts as layers that create dimensional wording that really stands out from the page! Check out the curls and swashes in this bad boy! We are in love and we know you’ll be too! All fully accessible to all, enjoy! A fantastic font for your ever growing collection! Aswatama is curvy in the right places and oh so great to use in large blocks of text! Possibly my favourite font in this tasty June bundle. Its graceful swashes and ‘thin to thick’ strokes are so playful and elegant, we’re in love! Ellie Mae has been a favourite here in the office due to its simple yet charming lines and who can resist the adorable hearts on the characters? The additional extras are simply too cute! We adore this font as it is so unique and we cannot wait to start using it. A great addition to your font collection and definitely a keeper! Voltunes Wild is a great typeface that couldn’t be more unique with its super original characters that bend and sway in such an unusual way! Who doesn’t need a font like ‘Scratchbook’ in their collection?! Perfect for so many different designs, the tall, thin letters are so striking and also comes in a rough version. Texas City is a new, exclusive thin font. The designer created this using a biro and their own handwriting! Worthy is a fabulous font that looks incredible in quotes with straight laced typefaces and some of the funky flowers included in this oh so tasty bundle. The Society is an original typeface that is reminiscent of classy signatures and old style calligraphy that seems to be a lost art! Black heat is a strong display font that literally jumps off the page. Great for grabbing the attention your new design deserves! LeOsler includes 12 separate font styles and a set of dingbats in 4 different weights! A massive pack, expertly crafted by an extremely talented designer. The whole collection retails for over $200 so grab yours today for a fraction of the cost! An original and feisty font that is a little rough around the edges and textured perfectly. Maghrib has done it again! Pratiwi has three fonts included. The standard font in all its glory, a sans version of the font and a vintage version. The three combine perfectly for a sophisticated look. An edgy script font? Yes please! The thick brush lines are so great for getting that rough yet deliberate look! Secret Words is a hand painted and cutesy script font that comes with a ‘pretty yet cool’ feel to it! Fun to use and perfect for quotes! Katsia Jazwinska is an incredible designer and we just love her style! We know you all do too and that’s why we have included her newest designs in this tasty June bundle! This font installs as Rising Brush and is so original in its style. The rough brush font is softened with the thin strokes that taper at the ends of certain characters. Enyo includes six different weights that make this font perfect for your larger design needs. Use the thicker weights for your header and then the thinner version for your block text and you have cohesion and style! A thick brush font that has a distinct grungy style. The additional characters are PUA encoded and accessible to all, so go wild! Melony is a gorgeous new font that is completely hand-drawn and full of character. We know some of you asked for Melony, so here she is! A sparkly, happy font that has fun little kicks and curls in all the right places! Great when combined with tall thin fonts like ‘Scratchbook’. The Bridges includes six fabulous font versions that takes your designs multi dimensional! Install all six and use them together as the family they are! A fabulous font trio that oozes fun! Sweet Water, Sweet Lilly and Lilly Pad are the best of friends and work fantastically together! Mandarin is a juicy new font that comes with a stylish set of swashes that add an extra bit of va-va-voom to your designs! Need a strong, bold, blocky font for your designs? Look no further! We have you covered with this macho font, Boldoa Mat. A beautiful name for a beautiful font! Jasmine is flowing, original and stylish. Once you have it, you’ll use it all the time! This cute forest collection needs to be in your design toolbox! Over 170 elements including animals, flowers, patterns and textures are included in this bundle, so have fun! From cakes and ice-creams to candy and croissants we have everything you need for a delicious day of designing! One of the most popular packs on the site is yours to grab along with tons of other products for a hugely discounted price! Use however you like, even for commercial purposes! This Flower Power collection is fun for so many different designs. A great pack full of flowers, florals, patterns and more! A bumper pack of 60 romantic cards that are ideal for all lovely occasions! Birthdays, anniversaries, weddings or just any happy occasion that you like! All of the romantic wedding elements that you could possibly need are included in this cute and pretty pack. There are over 400+ elements for you to choose from, we know you’ll love it! This mega pack of vintage, romantic patterns are available in both EPS and JPEG so that everyone can use them! The cupcakes and roses are our favourite! This HUGE pack of various doodles is a fantastic addition to any designer toolbox. A go-to must have that always turns up with the goods! Don’t believe us? Try for yourself! This big, romantic collection is jam-packed full of 200 elements that include florals and bouquets! Combine until your heart is content! This is a pack that is so well designed that we can’t choose between the elements inside! The magnolias are so life-like they jump off the page and there are three quotes included that will be your new go-tos. Patterns, seamless patterns and PNG elements make up this perfect peony pack. We love the florals! This Garden Tea Party pack is full to the brim with yummy teacups, teapots, flowers and banners! Perfect for our tasty June bundle! Items included may be used across multiple projects. Items included may be printed on to products that are subsequently sold. However, the digital font files must NOT be included in the sale of this product, or distributed for free afterwards. Items may not be manipulated, modified or changed in anyway and then re-sold or shared digitally.